Sarah, Eric, Me, and Monika. The IM Canada crew. 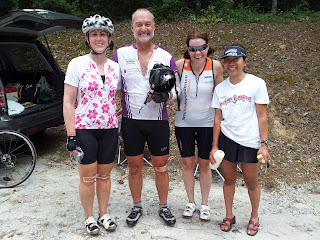 Yesterday Coach Mary had a 100 mile ride and 40 minute transition run on the calendar. So I headed out to Silk Sheets to ride a couple of 50 mile loops with the IM Canada crew and Ellen along to SAG. The IM Louisville crew was out doing 3 33 mile loops so we knew we would run into them and their SAG support, Katie and Carlos. I had explicit instructions from Mary to ride my pace, not waiting at any point, and to minimize my stops. I felt great for quite a while. I know that route very well so I know where to maximize my effort and where to rest. I was easily on track to finish easily under 6 hours and maybe as quickly as 5:45. Around mile 47 I went through a super sunny and hilly portion that sapped my strength but I recovered pretty quickly and made it back to what I planned to be my last full SAG at mile 56. I fueled up and was off for the last loop. The first 10 miles of this loop started pretty well and then the heat began to wear on me again. By the time I made the turn to head back to the park around mile 70 I was suffering a little bit and got some extra water from Carlos to pour over my head and back. At mile 72 I had to get off the bike for a minute because I was feeling dizzy and overheated. A break in the shade and some water over my head made me feel like I could go on again but I wasn't sure how it was going to go. It was real ugly. I pedaled up hill when necessary but coasted every downhill I could. About 5 miles before the park I dropped my water bottle and had to stop on the side of the road. Two other cyclists rolled up and seemed concerned whether I was going to make it but I assured them I only had 5 miles to go to my SAG and that I would make it. All this time I had been pondering what I did wrong. Did I not eat enough (1500 calories? ), not drink enough, (6 bottles of fluid), not enough sodium (3500 mg? ), was it just the heat? I usually hold up in heat better than this. My chest was super tight - maybe asthma? It was a tremendous relief to reach the park and see Ellen, Katie, and Monika. They got me settled in a chair with my inhaler and cooled down. I debated the cause with Katie and Monika and thought I might recover enough to finish the last 6 miles with Sarah and Eric. My inhaler wasn't helping the tightness in my chest. When Sarah and Eric showed up about 20 mins. later I was still dizzy when standing up and knew my day was over. So this morning when my alarm went off at 6:45am and I felt body aches, tightness in my chest, and a sore throat it was actually a relief because I knew yesterday's bad ride was a combination of the heat and this cold setting in. I'm of course not happy about being sick but it's a much better feeling than being concerned that I'm possibly not ready for IM. So the 3 hour run on the calendar wasn't possible today. I thought about doing a short run to try to shake out my legs but after lying in bed for a few more minutes and talking with Sarah I knew that wasn't a good idea. Next weekend is yet another opportunity to do a long ride and transition run. There aren't too many more weekends available to me so I'm hoping for some cooler weather. Only 49 more days to go!